Science fiction captured my attention in my youth and never let go. I’ve lived a thousand lives through a variety of novels. I love when authors bring me into their world and make me feel like part of the action. Normally, they do this using the traditional third person or first person point of views. However, this past summer I stumbled upon a science fiction novel written in second person. In order to understand what’s special about second person point of view (or POV) lets quickly go over what it’s not. With the exception of choose your own adventure books, most fiction novels are in first person or third person POV. First person is when the main character is telling the story. You’ll see a lot of “I,” “me,” and “we” throughout the story. Third person POV is the most common and uses “he” or “she” to describe the main character. There are many subsets of these two concepts, but we’ll save that for another day. Most of the time, we see second person POV in non-fiction. However, some authors do use this daring approach in fiction. This POV allows the author to tell the story from your perspective as the character. You actually become the protagonist. When done well, readers are immersed in the story as they imagine themselves as the main character. The story is told using “you” and “your.” This style of writing requires a great deal of finesse and attention to detail. When I first picked up A World Between Two I didn’t expect it to be written in second person. I also had never read second person fiction before, so this was a new and surprising experience all around. I’ll admit, it did take some getting used to, but within a few pages I was hooked. The author, J.A. Hayes, weaves an interesting tale of adventure describing contact with not one, but two alien species. Beautifully written descriptions intermingle with a smart, intense plot making this a book that readers can enjoy time and time again. It’s easy to relate to the main character who is an intelligent, strong woman with friends, family, and flaws just like the rest of us. What really stood out to me was the description of the alien beings and their surroundings. I really got a feel for the new twist on space travel which painted brilliant images in my mind. I recommend this read to anyone who enjoys a good, challenging read featuring previously unimagined science fiction concepts. Also, Hayes has taken incredible care to include several hidden gems throughout his tale. I’ve found what I’m sure is just a fraction of the easter eggs in this story. Comment below with what you’ve discovered! 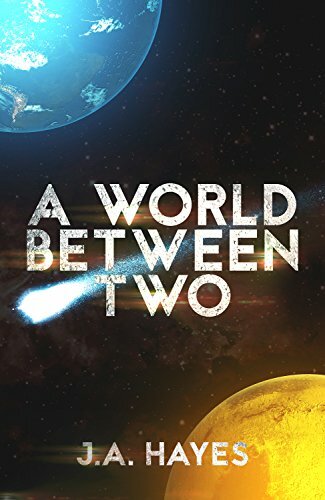 If you’ve enjoyed my take on this second person science fiction book, A World Between Two, sign up for my newsletter to get updates on my latest blog posts, progress, contests, giveaways, and more!